Home office these days is Goobies. On Friday, after a few days of discussing business strategy, I was set to return to St. John's. As I traveled down Old Mill Road approaching the Burin Peninsula Highway the idea of heading home to St. Bernard's for a surprise visit with mom and Dad popped into my head. On the spur of the moment, I checked the fuel gauge and clicked the signal indicator for a right hand turn. There are few opportunities to get out to St. Bernard's without the kids, not that I am trying to escape from them but sometimes some adult time is just what the doctor ordered. I am in my mid forties now, my parents are in their 70's. 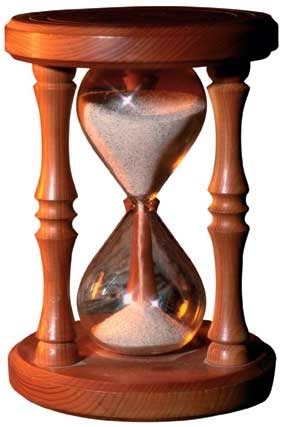 The sand in the hourglass are rushing to the bottom. Time, and with it my life, is passing by at an incredible pace. I might not feel older but that Little Archie perception of life is not valid. Time marches on. We grow older, our kids grow older and our parents do. We all have a terminal case of life. Our time on this Earth is brief. From the day we are born the only think we know for sure about our lives is that someday they will end. Going home is like going back in time. Sure Mom and Dad are older and life is a little more laid back. It is my holding ground. It is a place where time stands still, where you are never judged and always welcome. Everything is where it has always been. The grains of sand in the hourglass may be clipping by but at my Parent's house time slows down and I can have a blast being me. This is where I came of age. Where my brothers and I grew up in the most loving of households. Where we learned right from wrong. It is where we got our work ethic. It is tangible and real, so much more than a memory. The tastes, scents and even the heat feel so comforting. Even today, when I refer to home, it is not my cozy little house on a cul-de-sac in St. John's, it is my boyhood home. The little outport of St. Bernard's and all of its memories. The boy is long gone but the comfort and security of home always remain. Caelum non animun mutant qui trans mare current.